Now married to Hasan, and not entirely for political and diplomatic reasons, Julianne is kidnapped on her wedding night and flown by 'ifrit to an empty old castle called Revanchard, a place with its own violent history. For Revanchard is in the forbidden land of Surayon, hidden behind the folding land, a place despised and feared for dark sorceries and traitors - or so everyone is told.Everyone is on the move now: Marron and the Sharai army is in pursuit of Julianne; the Ransomers are marching to a holy war; and an army of poor is following a preacher. Everything will come to a head, and the truth behind Outremer revealed in this climactic ending to the trilogy.While the trilogy had a clear-enough beginning, quite a lot is left up in the air at the end. A chunky trilogy at around 600-700 pages each, its pretty typical for a fantasy series. The size doesn't bother me, I like them fat, but I did struggle to get through the lengthy descriptive passages. 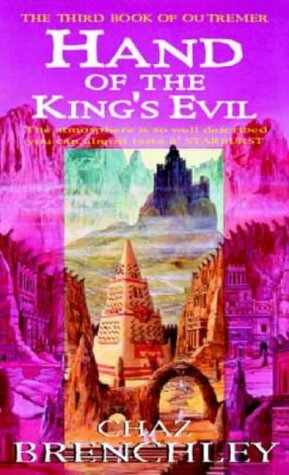 In Hand of the King's Evil I did what I rarely ever do: I skimmed whole pages. Maybe, maybe that's why the end didn't seem very clear to me, but I don't think so. I was impatient to get to the action, the decisive moments, and I found that, ironically enough, the more description there was, the harder it became for me to visualise. One other thing that ticked me off a bit was poor Julianne's fate. She has two husbands and doesn't get laid once. Ever. Not fair, definitely not fair! While Marron, young and pretty and often innocent as he is, has two men on the side and gets lucky even after he's sort-of possessed by a demon (the Daughter). The women came out of this tale with, in a way, less than what they had when they went in. Elisande loses Marron (though she never really had him), and her family, and even her country. So in that sense it wasn't very satisfying. Overall though, this is such a refreshing fantasy story - for its change in landscape from those tired English medieval forests and villages. I always appreciate these more "mature" fantasy stories, the ones that don't shy away from scenes and consequences and cruelties in order to shed light on human nature. As long as you have patience, I highly recommend this trilogy. Very solid conclusion to the Outremer trilogy. I read the first two books many years ago (this gap is not reflective of their quality, it's just me being slack! ); my memory of plot details is a little fuzzy and therefore I probably am not the best judge of how well this volume ties up all the loose ends. However, it certainly reintroduced me to the story and the major players in an economical fashion, the setting was thoroughly evocative, the characters were well-rounded, and it deftly and humanely navigated what could have been a minefield of ethnic and sexual stereotypes in lesser hands. The ending did feel slightly rushed; I think this series warrants a re-read at some point, so I can decide. And I will definitely be looking for more of the author's work! Another entertaining entry in this series setting up waht promises to be a grand finale in the book. Chaz Brenchley - Chaz Brenchley has been making a living as a writer since he was eighteen. He is the author of nine thrillers, most recently Shelter, and two major fantasy series: The Books of Outremer, based on the world of the Crusades, and Selling Water by the River, set in an alternate Ottoman Istanbul. A winner of the British Fantasy Award, he has also published three books for children and more than 500 short stories in various genres. His time as Crimewriter-in-Residence at the St Peter's Riverside Sculpture Project in Sunderland resulted in the collection Blood Waters. He is a prizewinning ex-poet, and has been writer in residence at the University of Northumbria, as well as tutoring their MA in Creative Writing. His novel Dead of Light is currently in development with an independent film company; Shelter has been optioned by Granada TV. He was Northern Writer of the Year 2000, and lives in Newcastle upon Tyne with a quantum cat and a famous teddy bear.Also known as author Daniel Fox.